(Photo credit: Kevin Carter, 1960-1994) Photo-journalist Carter committed suicide in July 1994, just months after winning the Pulitzer Prize for the photo. 2013 is the tenth anniversary of the Government of Sudan’s genocidal war against the people of the western region of Darfur. The Darfur genocide continues today, as populations that were ethnically cleansed from their land are replaced with non-indigenous people groups loyal to the regime. The Darfur 10 campaign is just one of many initiatives to commemorate the genocide. “As we look back on the past 10 years since the conflict began, we are reminded that more than 300,000 people have lost their lives and another 4 million have been displaced from their homes,” Darfur 10 reflects. I have a good (some would say annoying) memory for details. I also have the bad habit of holding onto emails for a long time. So somewhere in my computer, or in the hundreds of purple file folders that are stacked everywhere in my office or, remarkably, reside in the filing cabinet, I have pretty thorough documentation of the Government of Sudan’s first genocidal jihad — against the South, Nuba Mountains, Blue Nile State, and elsewhere since 1994, when IRD began focusing on Sudan. In those regions, the conflict was confusingly referred to as Sudan’s “civil war,” or the “North/South war.” Over 2.5 million people died, tens of thousands were taken into slavery, and over 5 million were displaced. The 2005 Comprehensive Peace Agreement (CPA) led to the cessation of active war throughout most of the region, but by the time of South Sudan’s independence in July 2011, Khartoum had already resumed war against the Nuba Mountains. A few months later, the people of Blue Nile were attacked as well. Khartoum’s supremacist agenda is also being implemented elsewhere throughout the country. Criminal neglect and cultural cleansing is slowly extinguishing the Beja people of eastern Sudan. And in the far north, Khartoum is literally “drowning” Nubia with dams on the Nile. The floods are wiping out traces of the great Nubian civilizations that pre-dated the Islamic invasion. Just as the genocide in Darfur should be commemorated, Khartoum’s decades-long genodical war against South Sudan and the other regions that resisted its agenda of Islamization and Arabization should be remembered, as well. Anyone who has seen it can never forget the famous photo above, taken twenty years ago this month by South African photo-journalist Kevin Carter, in March 1993 outside an emergency feeding center in Ayod, Jonglei State, South Sudan. 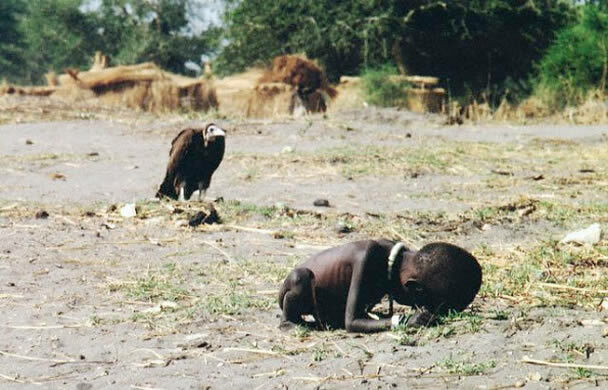 This image of the tiny starving girl and the vulture is still used to speak of “famine” in Sudan. The outrageous truth was that the famine was man-made, Khartoum-orchestrated — the deliberate starvation of a people by their own government. The same thing happened in the Nuba Mountains, in Wau, Western Bahr el Ghazal State, and in numerous other places. Today Khartoum is perpetrating the same starvation technique in the Nuba Mountains and Blue Nile State. It is time to remember the past — not just the ten years since genocide began in Darfur, but the decades of atrocities committed by the Government of Sudan. The sad truth is that those who cannot remember the past are condemned to allow Khartoum to repeat it. democRATS are coming—– lock and load.